Milk prices are so suppressed some U.S. dairy farmers are tightening their belts until no notches remain. To see higher prices, dairy farmers like Roecker want more demand generated for the abundant milk their cows supply. If this initiative succeeds, farmers, processors and the entire dairy industry will prosper. A rising tide of exports will lift all boats. We are mindful that the dairy checkoff program makes this global initiative possible. "USDEC staff is grateful for the generous funding we receive from U.S. dairy farmers through Dairy Management Inc. and the state and regional checkoff organizations," says USDEC President and CEO Tom Vilsack. "We are confident that working together we can reach The Next 5%." Because our farmer-funders are asking so many good questions, we decided to bundle answers in a printable three-page report (PDF) with charts and graphs that illustrate the challenges and opportunities. Share this resource with others in the U.S. dairy industry, especially our farmer-funders looking for signs of a brighter tomorrow. Four questions and answers are excerpted below. To get the full Q&A with illustrative charts and graphs you must click the red button to download the report. What is The Next 5%? The Next 5%—building U.S. dairy export volume from about 15 percent of U.S. milk solids to 20 percent—is a coordinated effort led by the checkoff-funded U.S. Dairy Export Council and U.S. dairy suppliers. While the goal is expressed in terms of volume, it’s more than a volume target. That’s because the U.S. dairy industry cannot expand volume as needed without heightening the focus on meeting the evolving demands of overseas customers and consumers with innovative, high-value products. Thus, The Next 5% is a dual-track goal to deliver volume expansion concurrently while lifting the value of the products U.S. Dairy is selling. 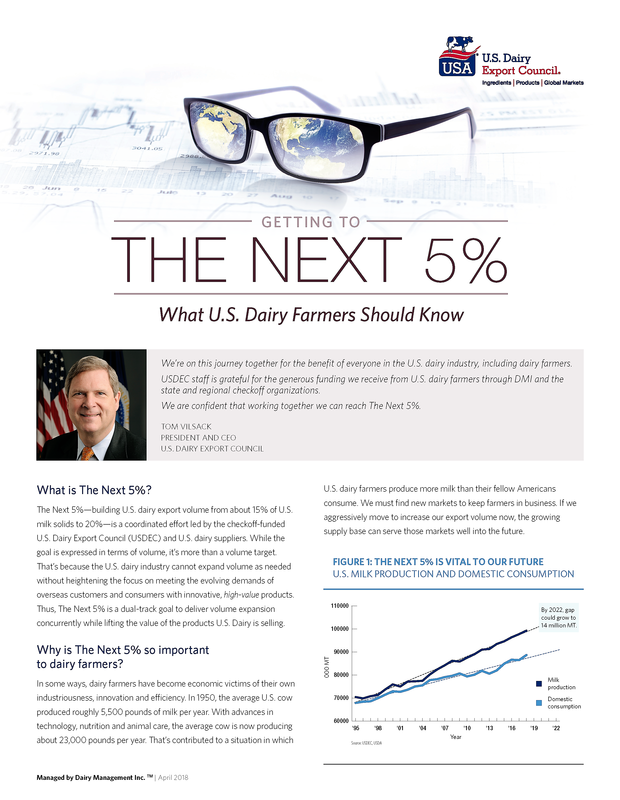 Why is The Next 5% so important to dairy farmers? In some ways, dairy farmers have become economic victims of their own industriousness, innovation and efficiency. In 1950, the average U.S. cow produced roughly 5,500 pounds of milk per year. With advances in technology, nutrition and animal care, the average cow is now producing about 23,000 pounds per year. That’s contributed to a situation in which U.S. dairy farmers produce more milk than their fellow Americans consume. We must find new markets to keep farmers in business. If we aggressively move to increase our export volume now, the growing supply base can serve those markets well into the future. 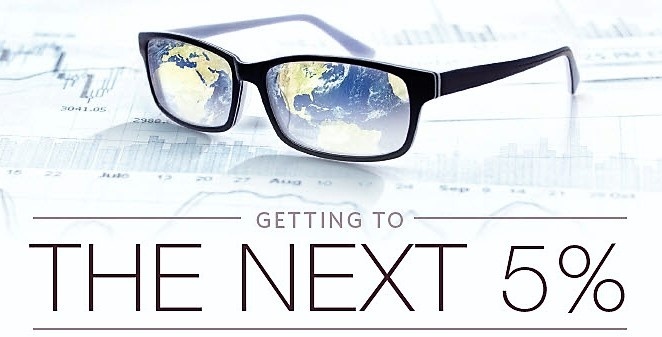 Why are overseas markets important to U.S. Dairy’s growth? Ninety-five percent of the world’s population—our potential customers—live outside the United States. Looking beyond our borders is where a significant part of our future business lies and where we can find more markets for our milk, products and ingredients. Since 2003, nearly half of “new” milk produced in this country has gone to exports. Is there strong global demand for dairy? With the exception of outliers Russia and Venezuela, global demand has been strong and consistent. Several factors account for this, including fast-rising populations, health-conscious middle-class consumers who want more dairy and can afford it—and an increasing appetite for Western-style foods, especially pizza and burgers. This means U.S. Dairy has great growth potential due to increased populations, rapid urbanization and a rising middle class that is demanding dairy. USDEC projects global dairy trade will increase by 2.3 million metric tons in the next three to five years. Margaret Speich is senior vice president of strategic and industry communications at the U.S. Dairy Export Council.